While my knee is slowly healing and getting better, I’m taking things real slow with my yoga home practice by starting slow before adding modified or challenging new poses to the routine.. I’ve decided to postpone them until this summer, when my knee is 100% better or close to it. But it does feel better to get back into a normal yoga routine for class and for my home practice, while the sun’s shining and the temperatures are warming up with a nice breeze. I do have my medicine leftover from last month, enough to get me by until the end of May, when I need it whenever it flares up. For my home practice, I’ve been doing the daily stretches and then adding the Sun and Moon Salutations to them, three times a week. What's your favorite yoga sequence? For my next Wednesday yoga class, after a month off, I’ve noticed two new yogis. We’ve started with some meditation and some various spinal twists and side stretches to warm up the session. Then we’ve gotten down to business with the Sun Salutation sequence a couple of times of cat-cow, down dog, mountain and raise arms, forward fold, plank, knee-chest-chin, upward dog, down dog, the awkward chair pose, another forward fold with a shoulder stretch, and back to mountain. We’ve added a new pose here, the twisted chair, which did a number on my back for a few moments. Then we’ve did the warrior poses of warrior I and I for both sides, along with the reverse warrior, the side angle pose, the triangle pose, and proceeded to the balancing pose. As for the tree pose, I haven’t altered my tree pose position yet. We also did some new yoga poses this time around, which were all doozies: the cactus pose, the bird of paradise, and the reverse plank after the reverse table pose. Then we’ve attempted to do the plow pose and the shoulder stand, which I wasn’t able to do. At the towards the end, we’ve done some final spinal twists and stretches, including rocking back and forth on our backs. We’ve finished the session with the corpse pose. For this Wednesday’s yoga class, after a month off, I’ve noticed two new yogis. We’ve started with some meditation and some various spinal twists and side stretches to warm up the session. Then we’ve gotten down to business with the Sun Salutation sequence a couple of times of cat-cow, down dog, mountain and raise arms, forward fold, the plank-up dog and down dog a couple of times with a block, the awkward chair pose, another forward fold with a shoulder stretch, and back to mountain. Then we’ve did the warrior poses of warrior I and I for both sides, along with the reverse warrior, the side angle pose, the triangle pose, and proceeded to the balancing pose. As for the tree pose, I haven’t altered my tree pose position yet. We also did some new yoga poses this time around, which were all doozies: the cactus pose, the bird of paradise, and the reverse plank after the reverse table pose. Then we’ve attempted the standing dancer pose, followed by the seated wide-legged forward fold. At the towards the end, we’ve done some final spinal twists and stretches, including rocking back and forth on our backs. We’ve finished the session with the corpse pose. During my Thursday’s Gentle Yoga class, we’ve warmed up on our back with the corpse pose and did some spinal twists. Then we did some leg extension exercises with our legs and did the inchworm pose, rocking back and forth on our backs and going in circles. Then we’ve did a couple of rounds of the Sun Salutations with the extended side angle and warrior poses with a couple of forward fords with the blocks. 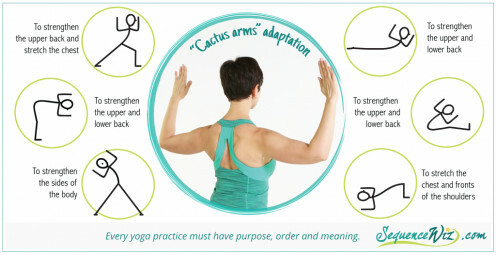 From there, we did a couple of new poses for the class: cactus pose, bird of paradise pose, extended kneeling pose, kneeling mountain pose, mermaid pose (which is different than the Pilates’s Mermaid stretch), and a few side planks. Later we focused on the cobra and the leg-arm balance poses on both sides, and the awkward chair pose. We’ve finished the class with some new leg extension exercises, some spinal twists, and a side stretch in the end with another corpse pose. For this Thursday’s Gentle Yoga class, we’ve warmed up on our back with the corpse pose and did some spinal twists. Then we did some leg extension exercises with our legs and did the inchworm pose, and then we were rocking back and forth on our backs and going in circles. 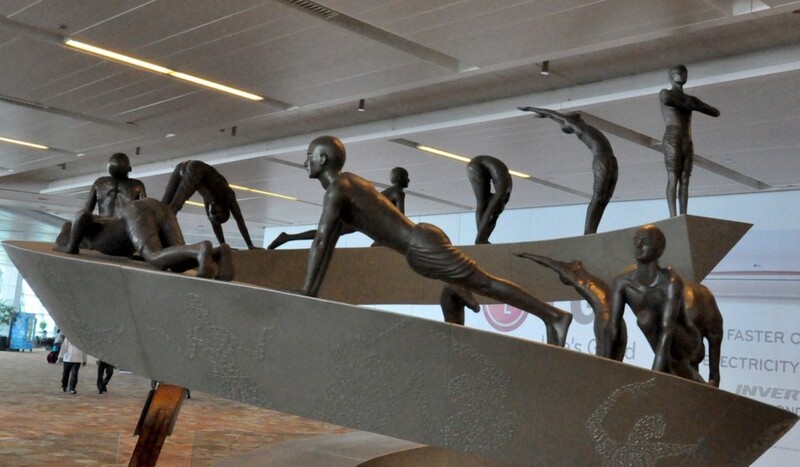 Then we’ve did a couple of rounds of the Sun Salutations with the extended side angle and warrior poses with a couple of forward folds with the blocks. From there, we did the cat-cow and the downward dog with the plank and upward dog in a few repetitions. We’ve done a couple of new poses for the class: an one-legged balancing pose, the seated forward bend, the hinged forward bend with straight and bent legs, some hip flexor exercises with the point and flexing of our feet, with a few side planks. Later we focused on the the awkward chair pose and did the tree pose in a sequence by moving our feet up to our calves with every breathing motion like from seed, stalk to plant itself. (I did manage to get my feet to half of my calf._ We’ve finished the class with some new leg extension exercises, some spinal twists, and a side stretch in the end with the mountain pose. Yesterday’s Friday yoga class was unexpectedly canceled without a substitute. For my Friday’s yoga class last week, we’ve took it outside, since the room have recently been painted. We started out with the easy sit and raised a yoga block in our hands above our heads. We’ve done some spinal twists to warm our bodies with some side stretches as well. We’ve began our workout with the lunge and the knee-chest-chin pose. We’ve followed it up with the plank, the cobra, up dog and downward dog and the down dog splits. We’ve also did some kneeling dancer/leg-arm balances and a couple of forwards folds, along with the camel pose, the half moon pose, the fish pose, side lunges, and a new pose, the wild thing (something I’ve learned during home practice last year). We’ve done at seated forward bend and seated wide-legged straddle, the triangle pose, the reverse table pose, some leg extension exercises, before we’ve closed out the session with the corpse pose. For my 6th Stretch-lates class, we warmed up to the familiar sounds of the golden oldies music playing in the background. We’ve started with the Pilates stance lunge and followed it up with the shoulder rolls, arms circles, the airplane bank (with and without the yoga blocks), and squats, both straight leg and bent knee with reaching with the arms and swinging them in a half-circle, and a new pose I would like to call the half clamshell on both sides. As for the straps, we did the lower thigh left stretch, the Vee stretch, the leg raise and the arm pull with roll overs. We also did the hug stretch, and then do a spinal twist like in yoga with our legs in a diagonal position. Then we’ve done both single leg taps, lower leg lifts and the hitchhiker stretch, the butterfly pose and made our legs flutter like wings, that was concluded with a back roll and a knee roll, before we’ve ended it in a Pilates stance with the stretch. For my 7h Stretch-lates class, we’ve started with the Pilates stance lunge and followed it up with the shoulder rolls and shrugs, deep squats, a couple of forward folds As for the straps, we did the Vee stretch, the leg raise and the arm pull with roll overs with the straps. We also did the hug stretch and did it in reverse, and then do a spinal twist like in yoga with our legs in a diagonal position and with a half push-up. Then we’ve done the mini hitchhiker stretch, the butterfly pose and made our legs flutter like wings, that was concluded with a side stretch, before we’ve ended it in a Pilates stance with the stretch. For my 6th Yoga-lates class, it was a small class, since it was warm outside. For a prop, we’ve used mini medicine balls that weighed 3.3 pounds each for a variety of the exercises. we started out with the easy sit and warmed up with some spinal twists and leg extension exercises, and the extended child’s pose, and the figure eight pose. We’ve did a couple rounds of the downward dog, and followed it by the downward dog, plank, the airplane bank, the mini hitchhiker pose, the star pose, the crescent and full moon poses, when we’ve raised and lowered the ball or balls in our hands. We’ve even placed it between our legs for the bridge and reverse table poses, the saw and spinal twist, the high clam and pendulum with some foot pulses, before we’ve finished our session. For my 6th Yoga-lates class, our class size went back to normal. We’ve started out with the easy sit and warmed up with some spinal twists and leg extension exercises, the child’s pose, and the extended child’s pose, We’ve did a couple rounds of the downward dog,some cat-cows, and followed it by the birddog pose and progressed to the sunbird pose, and the three-legged downward dog. We’ve even did the half camel pose and a kneeling bow pose, the hug pose and went in reverse, did a hip sway and some hip circles, and a couple of half push-ups, before we’ve finished our session. Hi Laura. It's a fun yoga pose. I'm continuing with the exercises for sure, just not at home lately. My knee's much better now, since this summer actually. I will for sure in my next batch of hubs. Amen, Dan. Good for you. Me neither. I love to nap after a good yoga workout. I took up yoga about a year ago at the local Y, and wouldn't give it up for anything. The best part of my workout. I love yoga! Hope your knee feels better and better. I need to get back into yoga...just love the way it makes me feel. :) Great hub! Hey Audrey. My knee is almost 100% better. Yoga helps tremendously. I'll do a new yoga hub tomorrow. I practice yoga most days --hope your knee is better and that the yoga is helping! Sally, so good to hear from you. I so agree with you, my friend, that you can always adapt it to fit your own needs. Thanks for stopping by. 3 years ago from Only In Texas! Flourish, that was a tricky balancing move. I hope we don't do it tomorrow. Use the wall is my guess for now. My knee's slowly healing without needing medicine for a while. Thanks for stopping by. Good luck with the recovery of that knee. How that lady does that Bird of Paradise pose, I will never know. I took the beginners session of Yoga t the local university a few years ago and it was helpful and relaxing. The more advanced techniques were a but much for me and the spiritual aspects of the most advanced that a friend of mine does are hard for me to digest. So, I do the basics of some Yoga, some Tai Chi and some Korean slow-movement exercise, especially before heavier martial arts classes. Thanks for the Hub and rated Up and more. Emese, better late than never. 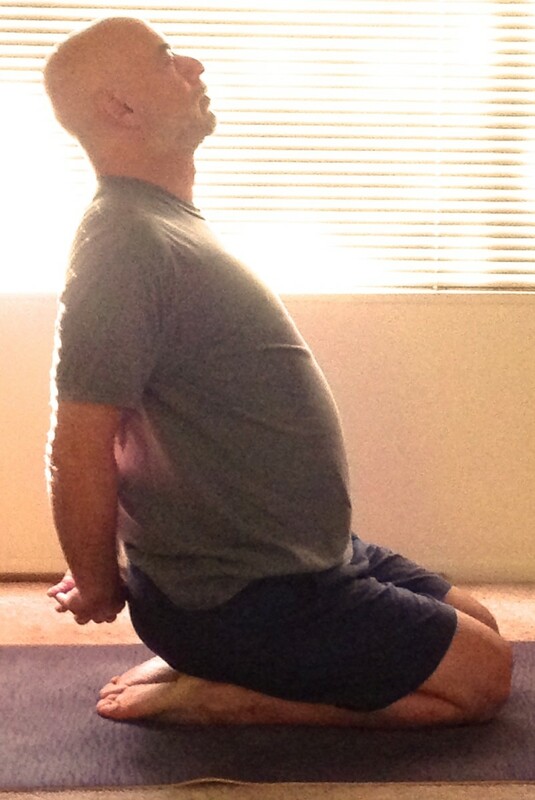 Yoga is a great way to relax and take care of back pain. Check your lcoal gyms or studios for free yoga classes. Welcome back to HP. I also write about Pilates too.